Andy Palmer: After Brexit, customs barriers will have "a much bigger impact on the bottom line than dealing with a 10 percent tariff." Aston Martin is on track to have four straight quarters of profit for the first time in a decade largely because of strong demand for its new DB11 supercar. The momentum is expected to continue as the British brand launches a revised version of its best-seller, the entry Vantage, later this year followed by its first SUV in 2019. The cloud on the horizon is the UK's pending split from the EU. 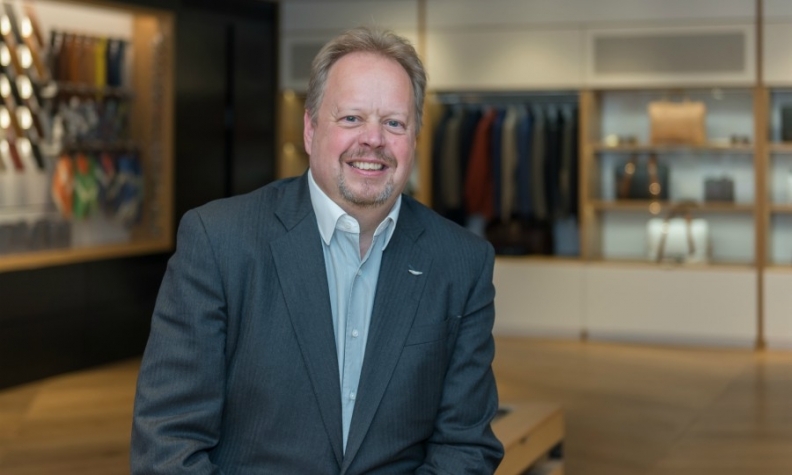 Aston Martin CEO Andy Palmer discussed these topics and more with Automotive News Europe Associate Publisher and Editor Luca Ciferri and Correspondent Nick Gibbs at last month's Frankfurt auto show. You had a great opportunity on your recent trip to Japan with UK Prime Minister Theresa May to voice your concerns over Brexit. What feedback were you getting? Our message to her was that the No. 1 concern is the non-tariff barrier. I can hypothesize how I can cope with a tariff. The thing that really hurts is the non-tariff barrier. The car is stuck in a port in Germany or France because the administrator doesn't rush to sign through the paperwork. That has a much bigger impact on the bottom line than dealing with a 10 percent tariff. We need import-export to be as frictionless as possible. Will Brexit force you to boost your local content? That's my second-biggest preoccupation. If we're part of the EU and we're exporting then we're at 95 percent local content. If you're exporting exclusively from the UK, then we're somewhere between 30 and 40 percent. We're a long way from 60 percent, therefore your origin-of-source under current regulations becomes an issue. Suddenly you've got to start re-shoring big lumps of metal back to the UK, but I can't see a scenario where we bring engine production back. The cost of capital for equipment on an engine is huge. Aston Martin vehicle sales were 3,687 last year. What will they be this year and when will you break the firm's 2007 record of 7,200? We should be at 5,000 cars this year, but that's not the real story. In 2007, EBITDA was 92 million pounds. Last year we were at 101 million pounds. So, the underlying efficiency of the company is more than double what it was in 2007. This year our guidance is 175 million pounds of EBITDA based on 5,000 cars. We shouldn't be getting excited about this. This should be normal. In reality, 7,000 is the production capacity on two shifts in Gaydon. We can see a clear line of sight to reaching that in 2019, when we will have a full year of the Vantage and the Vanquish replacement. What if you added a third shift? You can stretch it to 10,000 on three shifts, but it's quite inefficient to do a three-shift system. Why is having three shifts inefficient? Because of shift premiums and the planning maintenance, when you have to stand down the plant. Usually, the extra money you put in and the extra production you get out are not linear. You can do it, but it's better to build a new factory. MAIN CHALLENGE: Overcoming Brexit challenges. Your new factory in St. Athan, Wales, starts building the DBX SUV in 2019. We've been told the new plant replicates what you have in Gaydon, England. Does that mean total capacity will rise to 14,000? We have replicated it from a factory layout point of view, but we've only capacitized up to 5,000 units in two shifts because we haven't yet got the firm numbers from product planning from the other models off the large platform. What volume will the DBX have? About the same as the Bentley Bentayga [which topped 5,000 sales last year]. It's a fair proxy. But it's a very different product. We don't use someone else's platform. The real answer is that nobody really knows. Will DBX cannibalize your sports car sales? I think we will end up taking customers from Range Rovers and Porsche Cayennes because 72 percent of our customers globally have an SUV in their garage, mostly Range Rovers. The electric RapidE sedan is due in 2019. Will that be built in St. Athan? The final assembly may be St Athan. We're making it the center of electric development. But with 155 cars in total it's wherever you can find space. What is the goal of the RapidE? It's a learning experience. We will know who the customer is so we will have direct communication with them. That allows us to take that learning directly into the next development. Most of the customers have been identified. Will you lose money with the RapidE? We won't be making a lot of money on them that's for sure, but that's not really the point. Each one will cost about 200,000 pounds. You've said you're interested in playing a bigger role in Formula One. What needs to change in the 2021 regulations to get Aston Martin to start a team? They need to be grossly simplified. The engines are too complicated. If, and it's a big if, you see the likes of heat recovery disappearing and the simplification of the engine, it's not impossible to imagine a company that's growing like Aston could have an interest in being a part of that story. Do you care about cylinder count in F1? No, but I care about noise. To put an Aston badge on it has to sound right, and that's one of the debates. I would love to have V-12s or V-8s, something that brings the visceral excitement back. F1 should be at the top of technology, sure, but it also has to be entertaining.